Freaked-out people are largely limited to fiction, according to a new study. If science fiction’s to be believed, humans are going to absolutely freak out when we first encounter extraterrestrials — we’re talking pandemonium, nothing short of out-and-out hysteria. From Independence Day to Alien, your average human in a movie doesn’t take well to meeting our newly-discovered alien neighbors, who, to be fair, are usually threatening the widespread elimination of humans in some way. But if you talk to the average person, you might get a different picture of what a reaction to first contact might look like. Most people aren’t so alarmed. In fact, they’re pretty optimistic about what meeting aliens might mean. Most of us are like the kids in E.T., rather than the terrified adults: A reaction that’s less reflexive hostility, more peaceful curiosity. 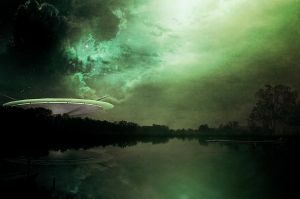 A new study suggests that, in the event of an extraterrestrial encounter, the rioting and looting would be kept to a minimum — humans would actually react pretty positively to the news. Michael Varnum, assistant professor of psychology at Arizona State University, took several different approaches in his study, which he presented during a press briefing at the annual meeting of the American Association for the Advancement of Science (AAAS) in Austin, Texas. For the first part, he and his team used a computer program to analyze the language used in news articles about discoveries that indicated the possibility of alien life. The program focused on the emotional timbre of the articles and found that the media coverage was generally positive. The researchers also made a (hypothetical) announcement that humans had detected extraterrestrial microbial life, and asked more than 500 people to offer their written responses. Again, the language the authors used was largely positive. As for something that feels a bit more real? In the final part of the study, the researchers asked 500 people to respond to one of two articles in the New York Times about real scientific discoveries: evidence of microbial life on a Martian meteorite and the creation of synthetic life in a lab. Interestingly, participants reacted more positively to the possibility of alien life than the human capacity to create life. “[T]aken together, this suggests if we find out we’re not alone, we’ll take the news rather well,” said Varnum in a press release. Varnum’s studies, it should be noted, only took American perspectives into account. First contact would affect the entire human population (and probably some other types of organisms, too), and different cultures might respond to the news very differently. Plus, it’s easy to be optimistic about something that you know hasn’t happened. Many of us are simply rosy about going to the gym, but hate it once we’re actually there (or, conversely, we hate the idea of going to the gym, but love it once we’re actually exercising). After all, we are humans, and we do tend to do a great job of tricking ourselves into looking forward to things. If scientists have their way, the question of whether extraterrestrials exist won’t be hypothetical for long — increasingly sophisticated technology will help us detect aliens, if in fact they’re out there. Playing out possible scenarios and getting a sense for how humanity would react to such a discovery could help governments come up with better-informed policies for how to handle first contact, when and if it arises. Ultimately, we can at least hope that humans would have an upbeat reaction to the discovery of alien life. We can test the waters, make policies, or play out different scenarios in the fictional space all we like. But the best way to figure out how humans will react to extraterrestrials? Find the aliens. Then we’ll really get to see if humans are as upbeat as researchers predict.